Performance Tires - Orinda Motors Inc.
All tires are not created equal—if you drive a high performance vehicle, odds are you’re going to need a set of performance tires to match. At Orinda Motors, our tire specialist can answer all your tire questions and help you decide if your car needs high performance tires or, if not, which tires will be best for your car. As a general rule, sportier cars require tires that lend a superior degree of handling and grip at higher speeds. We offer a variety of different tire makes that are sure to meet your car’s needs as well as your budget. Performance tires are not tires every car needs, but they offer a different quality of drivability that every car driver wants. The level of grip varies between each of the different tire makes, and this is a concern for vehicle owners driving in cold weather. Drivers of high performance vehicles usually have all weather tires that they use during the winter and fall seasons, along with a set of high performance tires for drier weather. While inquiring about a new set of performance tires, be sure to ask about nitrogen filled tires. Orinda Motors offers nitrogen instead of compressed air to fill your tires, which has proven to add to the general performance and life of your tires, as well as boost your gas mileage. Although many high performance car owners have performance tires on their vehicles, they often change the tires with the given season to ensure safety and optimal drivability. At Orinda Motors, we offer very competitive pricing on all our tires and services., Please feel free to call us with all your questions and concerns regarding high performance tires. The tires we proudly carry at Orinda Motors Oil Change & Tire Center include: Sumitomo Tire, Hankook, Bridgestone, Michelin, Cooper Tires, Kumho Tires, Continental, General Tire, Fuzion, and Uniroyal. 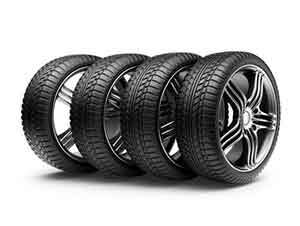 Of course, if there is a brand of tires you are curious about, please feel free to call one of our tire specialists. If it rolls, we can probably get it for you the very next day! For those automobile admirers who own classic cars, we proudly deal in those, as well. If you need specific tires ordered for your favorite classic, we can put in special orders. In addition to our incredible selection of tires and fill options, we also offer flat tire repairs and wheel service & repairs. To make sure your car is operating at its best, try out tire pressure monitoring system service and repair, as well. From keeping you safe on the road to providing the perfect performance tires, we’re your guys!